This oceanfront luxury home with a pool and private walkway to the beach offers 5 bedrooms, 5 ½ baths and comfortably accommodates 16. (Please note: The outdoor firepit has been removed). First floor has one bedroom with queen bed and a sleeper chair, and a private ensuite bathroom with a handicap accessible shower and vanity. Dining area is located street side, and opens up to an expansive open living space. Large kitchen offers granite countertops, stainless appliances, double oven, two refrigerators, two dishwashers, icemaker, second prep sink, and more. 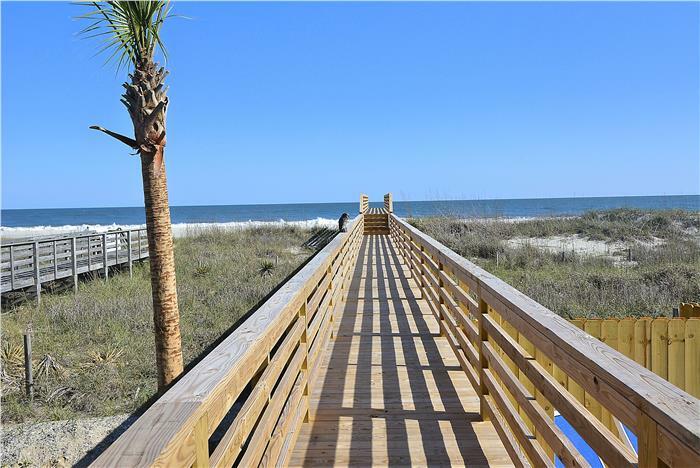 Second floor has two oversized oceanfront master suites with private bathrooms, whirlpool tubs and large walk-in tile showers and double vanity sinks. Both of these bedrooms feature king size beds with overstuffed comfortable mattresses. One of the master suites has a sleeper chair to accommodate an extra person. There are two other bedrooms on this level: one bedroom has a queen bed and a sleeper chair, with an ensuite bathroom. The opposite bedroom has two sets of bunk beds, one of the bunk beds has a pull out trundle bed. There is an ensuite bath for this bedroom. Private pool measures approximately 12x26. Entertain poolside with outdoor kitchen access under a covered area with refrigerator, bar and sink; gas grill available. Heat the pool from Oct-May for $100/day. The hot tub is heated as part of the rental and is separate from the pool heat. Linens and bath towels are included for each rental stay. Covered parking for up to four cars. Please, no smoking and no pets.